One of the first things that comes to mind when I think of NYC is the fantastic views the city has to offer! This is why we love rooftop bars and lounges as well as hotels that let you look out over the city. 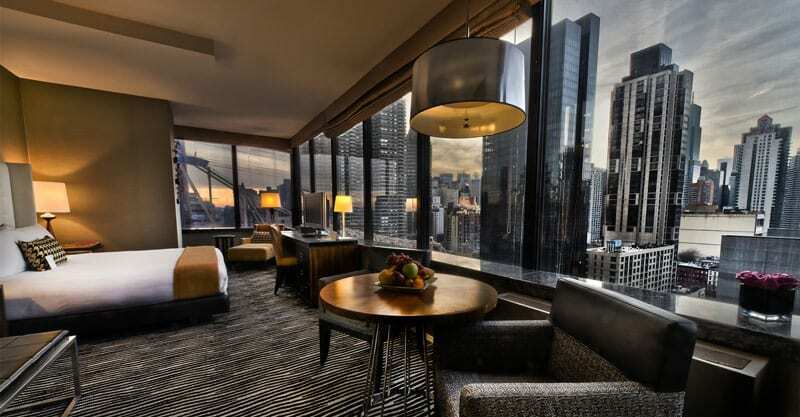 Admiring all the famous skyscrapers and buildings of New York while relaxing and enjoying the wonderful privacy of your own hotel room is a great way to start your mornings in New York City. During our last stay, we enjoyed views across the Hudson River throughout the day and night. Our hotel room at the The Standard High Line had an amazing view of everything from the High Line Park to One World Trade Center. It’s sensational to wake up or slide into bed with a view like that just beyond your toes. Thanks to online discounts, you can also take advantage of lower prices for hotels in New York with a view like this on a regular basis. We were blown away many hotels we have stayed at in the city and have therefore compiled this list of the best ones with a view. 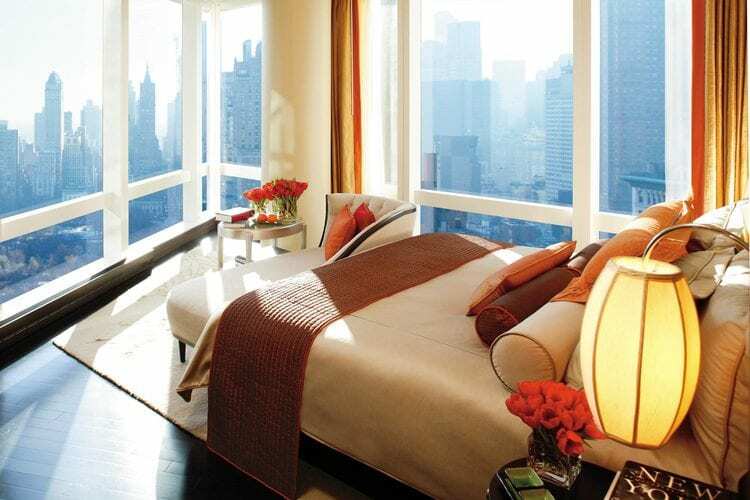 The hotel with arguably the best views of Central Park and Columbus Circle is the Mandarin Oriental. This luxurious hotel is a wonderful combination of classic design and a touch of Asian style. 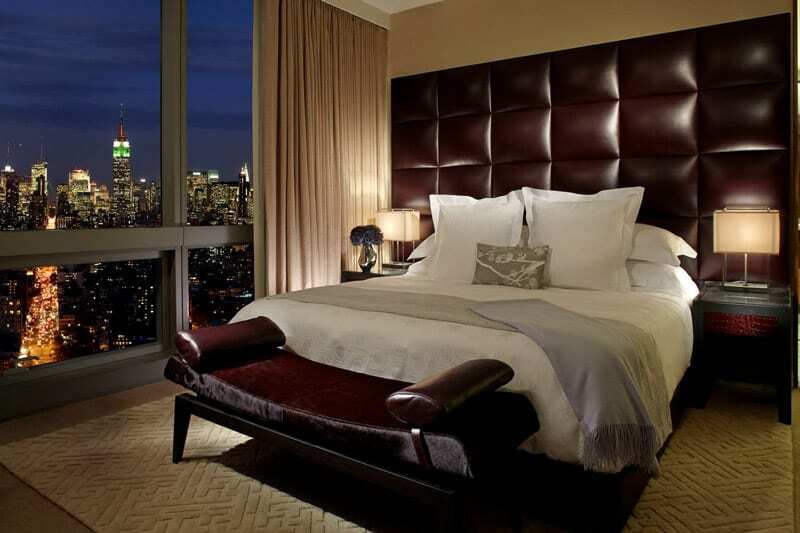 The guest rooms are beautifully appointed and provide the best panoramic views of Central Park. It has earned its place on this list! You will however have the difficult choice of selecting a room facing Central Park, or a room with views from the George Washington Bridge all the way to the Statue of Liberty. Whichever direction you choose, the view from the floor-to-ceiling windows ensure an absolutely spectacular vista of NYC. This hotel has been added to the list as it is one of the favorites of our Facebook fans. This is mainly due to the New Yorker’s fantastic location. Only 3 blocks from the Empire State Building and one block from the shopping paradise Macy’s at Herald Square this hotel is truly in the midst of NYC. Check out our Macy’s shopping guide here. 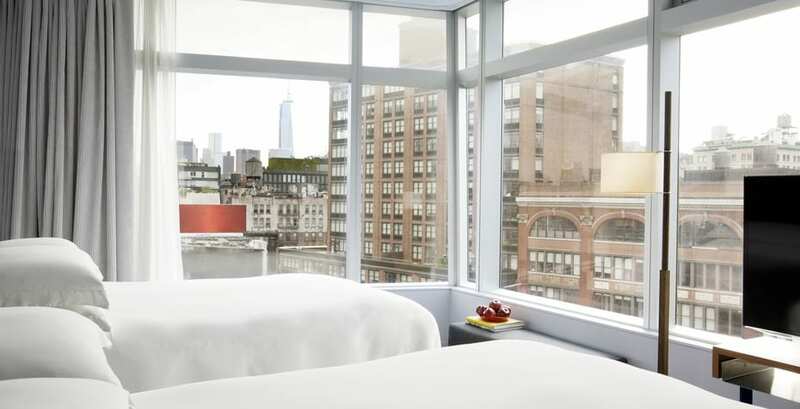 The Standard High Line Hotel is located in the heart of the trendy Meatpacking District and offers tremendous views of the Hudson River all the way to One World Trade Center. Sunsets are especially breathtaking and the floor-to-ceiling panoramic make sure you can see it all from your bed. Additionally, the hotel features a superb restaurant as well as a sheltered area called The Plaza, where you can enjoy freshly-made focaccia or burrata (Definitely try this, its delicious!). The bathroom also has incredible views – great for taking a relaxing bath while looking out over the New York skyline & the Hudson River. 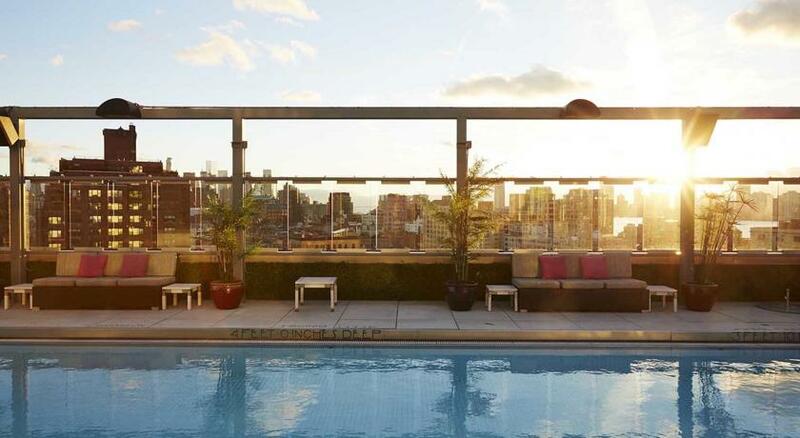 The Gansevoort Hotel in the Meatpacking District is just a block from High Line Park and was made famous for its number of celebrity visitors as well as its rooftop pool. As a hotel guest, you can sit around the pool and enjoy the view over the rooftops of the city. What makes this location particularly special is that you can enjoy the sunset over the Hudson River every day. 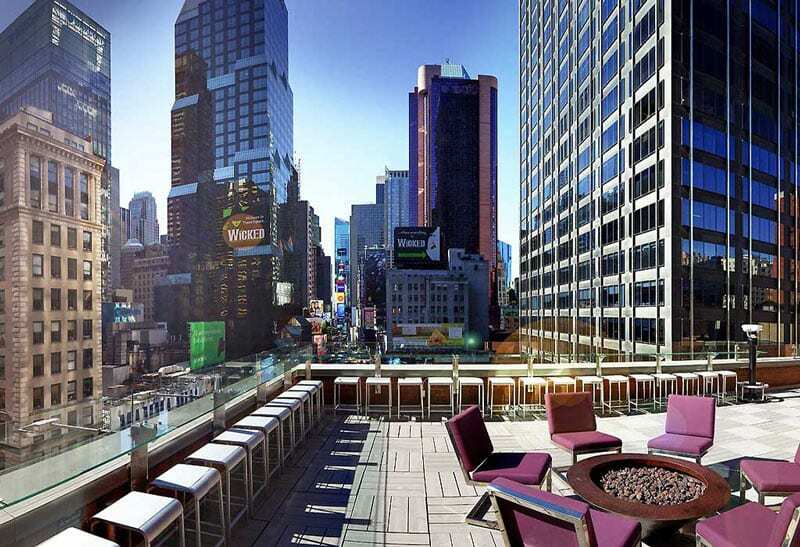 The Hyatt at Times Square arguably offers the best views of Times Square at the heart of Manhattan. Lively, colorful, and always full of action – you can relax in your room and watch the hustle and bustle down below. The guest rooms are well furnished giving you a feeling of bring right at home. The hotel has 54 stories however each floor only consists of 11 rooms, meaning the spaces are spacious and the floors are quiet. 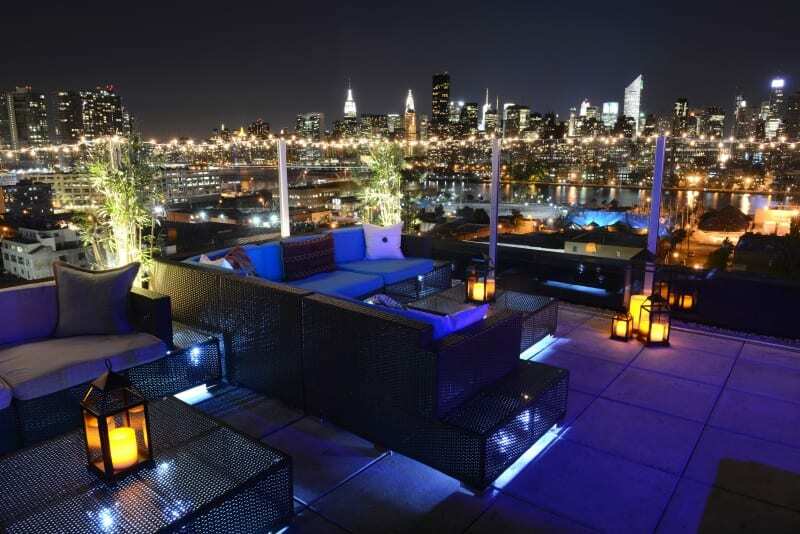 The hotel also has its own rooftop bar, Bar 54, which offers fantastic views of everything from the East River to the Hudson. When it gets cooler you can also head to the lounge or to the deluxe spa area, which offer amazing views and a fireplace respectively! I give this property extra credit because some rooms also feature their own balconies from which you can enjoy the cityscape in peace and quiet. The newly-renovated Novotel Hotel is also located at Times Square. The interior of the rooms are furnished in a very modern style and are decorated in a colorful manner. 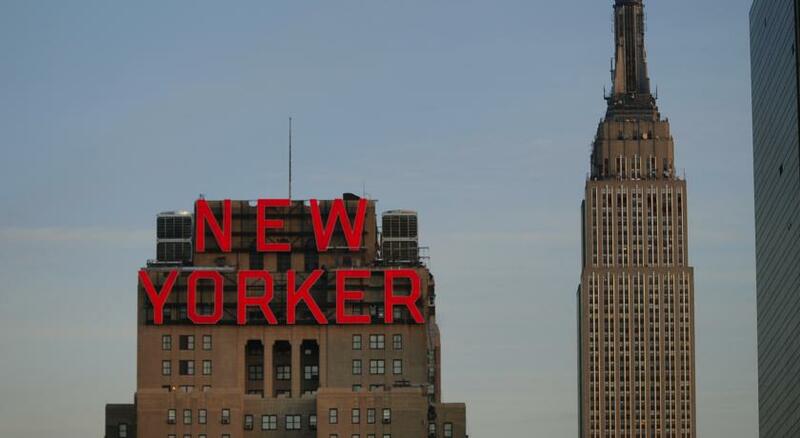 The hotel offers views of Broadway, Times Square, and the Hudson River, depending on which way your room is facing. Its central location makes it highly desirable as the heart of NYC is no more than a few blocks away. Don’t worry about the noise however, you will still find some peace and quiet to sleep thanks to the soundproof glass of the floor-to-ceiling windows. If you want to be close to Times Square. 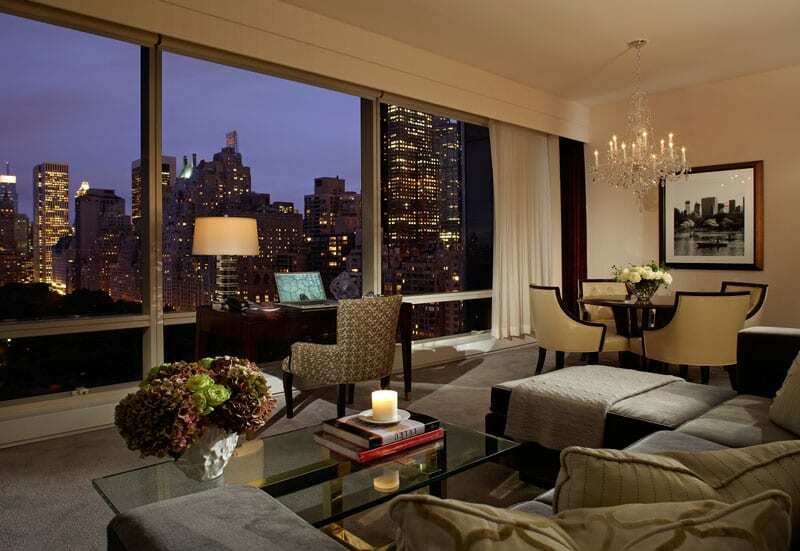 this is definitely one of the best hotels in New York with a view. 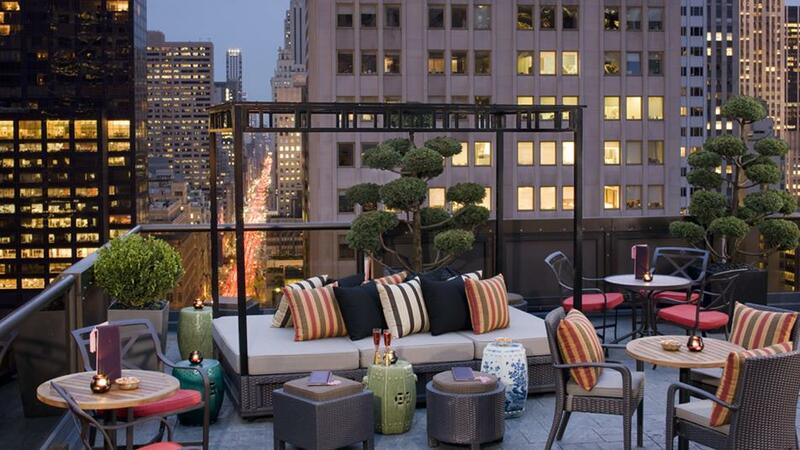 The Peninsula Hotel should be included in every list of hotels in New York with the best views of Manhattan. It is located in the center of Manhattan and the skyline seems close enough for you to reach out and touch it. Its location on 55th Street and 5th Avenue means that you can feel the energy of the midst of the city from its terrace. While the views are impressive during the day, they hit a whole ‘nother level as soon as darkness falls. From here you can watch the yellow taxis stream through midtown in the rhythm of the traffic lights and the tiny-looking people hurrying amongst them from above. You can also enjoy this incredible view from your bed in the spa area thanks to the floor-to-ceiling windows. The Peninsulas small rooftop bar – The Salon de Ning – is also a great spot to spend your night! What distinguishes The Strand Hotel from the others on this list? 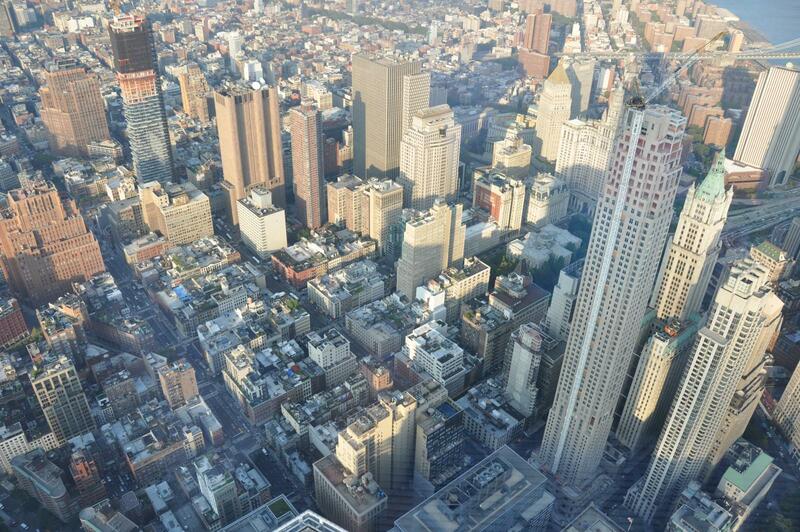 We think that it’s the incredible views of the Empire State Building that sets it apart from the other 15! 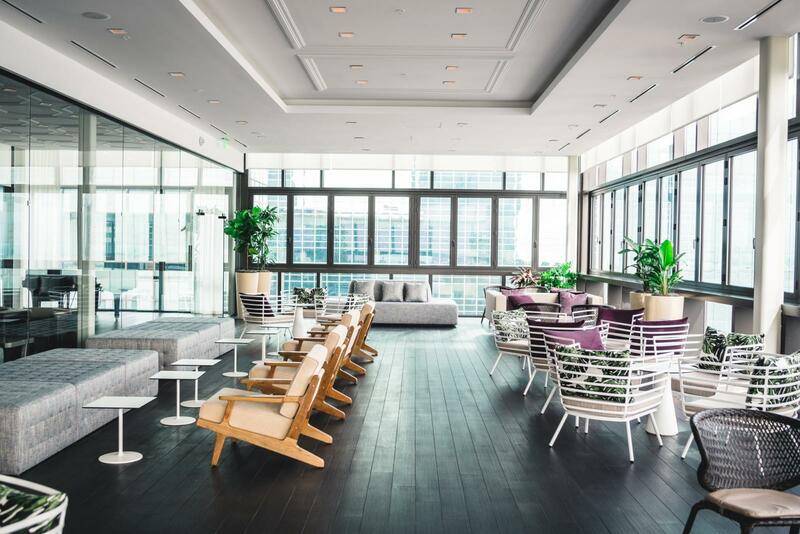 Additionally, the hotel also offers a rooftop lounge where you can relax, have a drink, or grab a bite to eat. Just about every room has a fantastic view of the Empire State Building, making the deluxe rooms particularly sought-after due to their combination of size and vistas. Another plus is that this property is not quite as overrun as some of the others – our stay here has always enjoyable. The Standard East Village is the sister property of The Standard High Line and is very similar in its style and cleanliness. Its East Village location is perfect for those who are gastronomically inclined. Getting to famous restaurants doesn’t require a long walk either – the restaurant, “Narcissa” by innovative chef John Fraser for example, is right next door. The Trump Hotel is located in one of our favorite districts of New York: SoHo. Since the rest of the neighborhood isn’t filled with skyscrapers, the hotel stands out significantly. This caused a number of controversies during its construction due to many locals favoring a building that would conform to the building height of its surrounding architecture. The hotel was built nonetheless, and as a result offers some incredible views over Manhattan. It is beautifully decorated, and the floor-to-ceiling windows provide a view in the direction of your choice. Guest rooms feature predominantly dark materials & furnishings, instilling a calm and soothing atmosphere. The Nolitan Hotel is a small, exquisite boutique hotel wonderfully tucked away in Little Italy. There are two things I particularly like about this property: the decor is extremely nice – light, bright, clean, and airy – and its balconies. 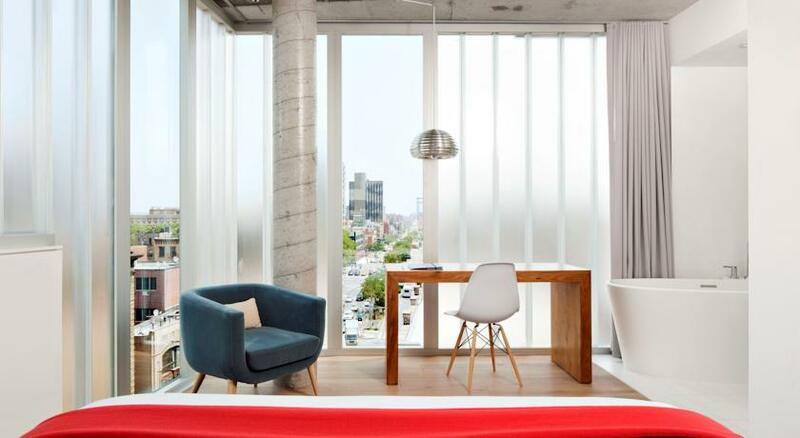 From the balcony in your room you can enjoy views of the Empire State Building and the Williamsburg Bridge. The lounge on the top floor also gives you excellent views of One World Trade Center. 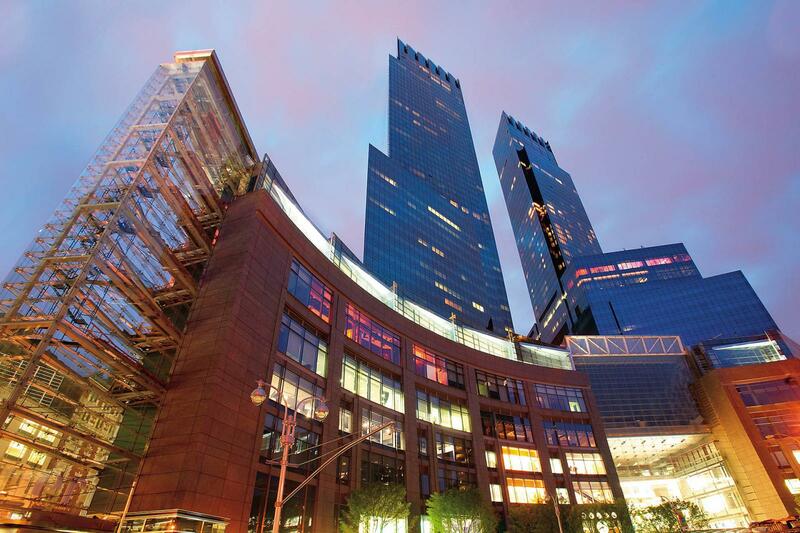 The Trump International Hotel overlooks Central Park and is located right by Columbus Circle. The views are amazing and since the guest rooms feature floor-to-ceiling windows that capture the allure of the city you can relax on your bed and look out over the lights of the city and the concrete’s contrast to central park. The hotel has not one, but two restaurants, as well as a 6,000 square meter spa area. If you are looking to combine luxury with the best views of Central Park, all roads lead to the Trump International! 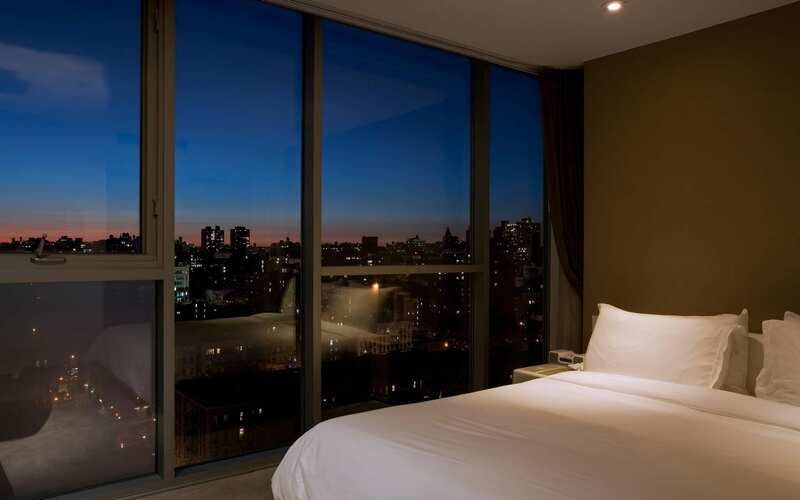 If you would like to enjoy views over the entire Manhattan skyline, you should consider staying at the Z NYC Hotel. This popular hotel is located directly at the 59th Street Bridge (Queensboro Bridge) in Queens. 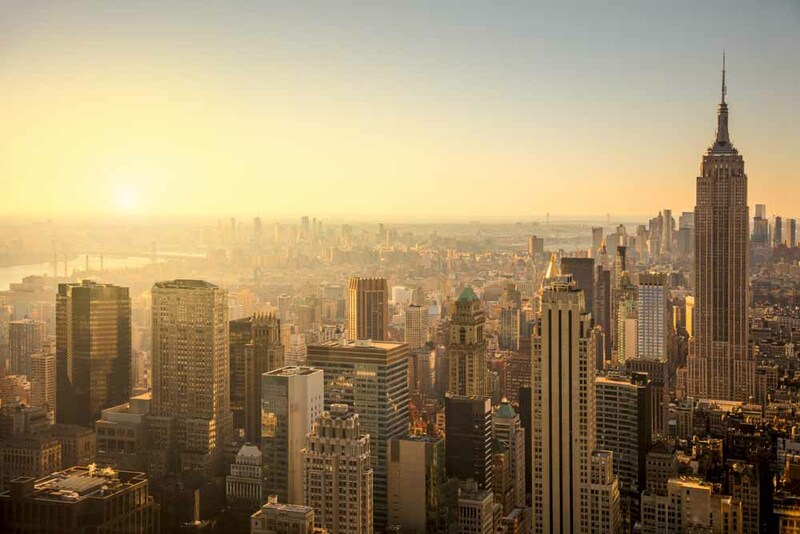 Getting from Manhattan to the Z NYC Hotel is fast – the hotel offers free shuttles between the two boroughs. Another option which we recommend for getting across to Manhattan is the water taxi which will get you across the East River in just a few minutes. 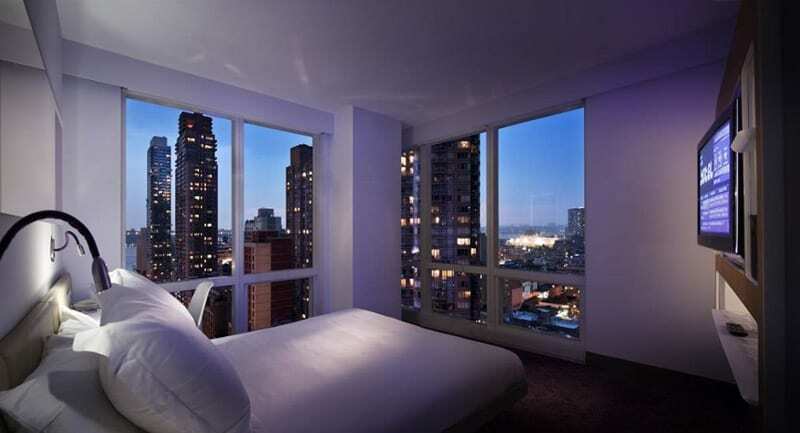 The YOTEL at Times Square, proves that a well designed hotel with good views does not necessarily have to be expensive! Rooms are modern and have a minimalistic Scandinavian feel, instilling a certain sense of calm as you gaze out over the busy city. 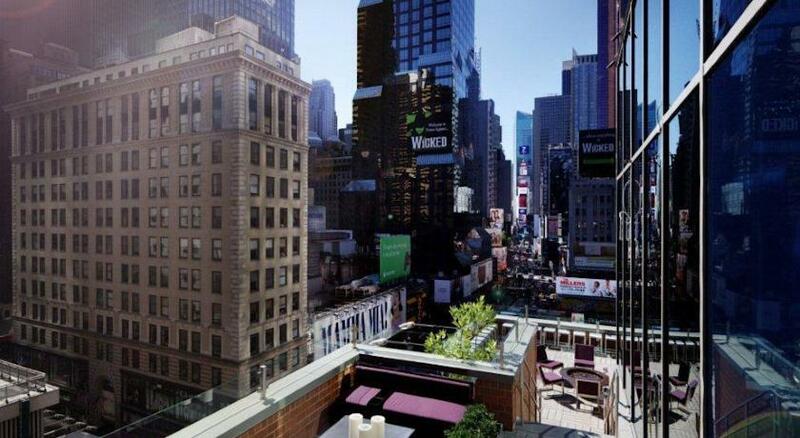 We highly recommend the YOTEL as it is one of the most popular hotels in New York and its combination of price and views are unmatched. 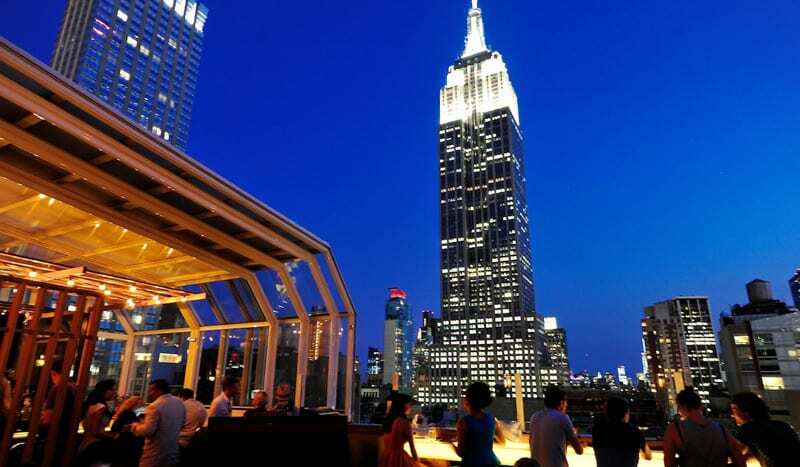 Its rooftop bar with views of the New York skyline is also a highlight of the hotel. The Bentley Hotel is located on the Upper East Side on 62nd Street and is one of the many beautiful boutique hotels in this area. What makes this property special is its proximity to the East River. The decor really works well and makes a relaxed impression with its mix of cool and warm materials and colors. From the Bentley’s rooftop bar, you can admire not only the Queensboro Bridge, but also the grandiose views of the Roosevelt Island Tramway. The rooftop bar is really a full blown restaurant and offers delicious food (Definitely try the ribs here). Rockefeller Center, with its famous viewing platform Top of the Rock, is also just a short walk away. The Ritz-Carlton Hotel at Battery Park gives you the best views of the Statue of Liberty, the New York City harbor and the Hudson and East rivers. It is located at the most southern tip of Manhattan right by Battery Park and makes you feel as though you’re standing directly above the water. If you want to enjoy views of the Statue of Liberty, look for rooms that have the name of it in their description. The views across the water are incredibly impressive and relaxing and remind you of the fact that beautiful Manhattan is in fact an island. We couldn’t help but add one more hotel to our list! The Hotel on Rivington is named after the street on which it is located on the Lower East Side. It is a highlight on all lists featuring hotels with the best view of the city. The hotel was designed to include generous spaces and features, as well as large rooms that are well furnished. 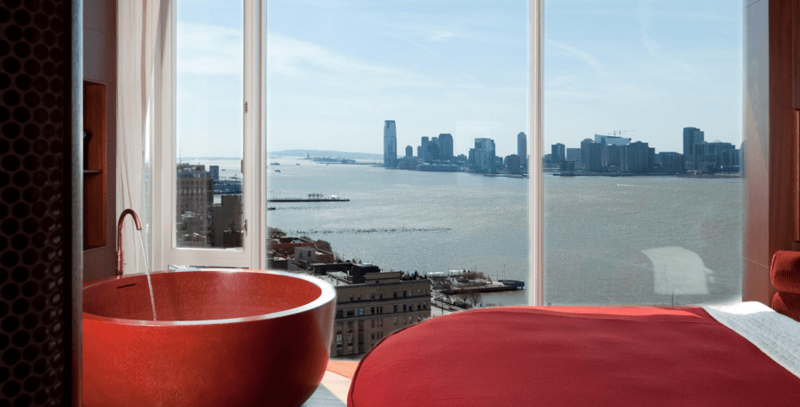 The floor-to-ceiling windows offer you views all the way to the East River. The views will most definitely take your breath away as you let them sink in while sitting in the hotel’s top floor lounge and rooftop bar, The Penthouse. Great reviews of brilliant hotels would go back at the drop of a hat! Well this makes me cry 😓.I have dreamed of going to New York City since ;I was a Teen and now at 51 I still have not gone. Wish I could just be lucky and get a check.